Ted Obvious writes from Brussels in reaction to another absolutely pointless European Union summit, these types of gathering cost a lot of money and they are more trouble than they are actually worth. There are many keynote speakers in Europe to talk to about European policies and help finding more about what goes where in between who likes who. The EU budget is coming next year and from that everything will be squeezed out of Europe here are the two sides of the coin. countries like Germany and Britain, want it the budget frozen. 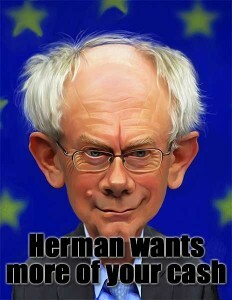 The European Council Herman Van Rompuy is juggling and freezing finances and will be for the next seven years to keep everything in good standing. By then the next generation who will be members of the EU will be less inclined to want fat juicy grants and free from any blackmailing less weight on the EU reps collar. Humorously German Chancellor Angela Merkel Ted says live that she was dragged into the Euro zone and that German taxpayers are starting to notice the bills piling up. 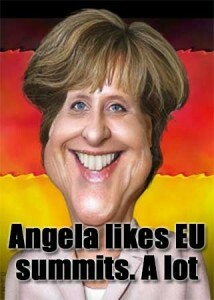 He follows on to say Angela Merkel would rather be seen in a mini-skirt than abandon Europe's newish currency. French President Francois Hollande disappoint the local economy with a pointless victorious war in Mali but create that well sort feel-good factor for the nation. Mr Hollande and French farmers have a go at Britain as cows run loose and for cherry picking in Mali and sprouting out all kinds of things in Brussels and a quick recapp on the British rebate something that been Margaret Thatcher sorted out years ago. Patriotic games at the EU summit by British Prime Minister David Cameron with the referendum debate and the EU membership. The EU project is showing more cracks in the surface than Mars or the moon. 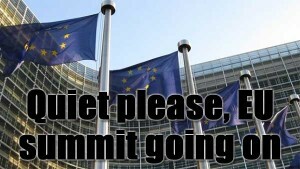 What a waste of time and money these EU summits are. High the time they should just be banned or cancelled last minute. Or at least fine European leaders if these summits don’t produce anything. Here We Go Again. Another Absolutely Useless EU Summit Under Way In Brussels.